It seems like our spring cleaning post might become an annual post. While the weather may not be consistently warm and sunny, it’s time to come out from the comfort of our homes and offices, look around and re-engage. Just the other day, I did a quick review of my 1st-degree connections in Baltimore and then headed over to Sales Navigator and noticed that nearly 100 of them had changed jobs in the last 90 days. I also noticed that 120 of my 1st-degree connections in Baltimore follow our LinkedIn Company Page (thank you!). Noticing this makes me more aware of who I’m connected to and reminds me that I have an opportunity to send a quick note to congratulate, ask how they’re doing, get back in touch or just say hello. It’s spring and it’s time for us to come out of hibernation. P.S. And, by the way, I’m interested in others with this approach not about what I can say about us, what we’re doing or why they should work with us. Erin: At the beginning of the year, I took some time to re-work my Headline, Summary and Intero position description. I think this should be an annual (at least) exercise for every LinkedIn user. A lot can change in a year! When you review your current profile content, does it really get to the heart of your work, or does it read like an internal job description? What information is no longer true or applicable? Spring is a great time to get things back on track! For this Spring, I’ll be focused on writing Recommendations for, and requesting Recommendations from, my network. I’ve worked with so many wonderful clients over the years. I believe in their work and want to share that goodness. I also want for people visiting my profile to be able to understand what it’s like to work with me through the experiences my clients have had. I’m really excited to create this extra value for my network! Sydney: Speaking of coming out of hibernation, my spring goals are to build my network and give my LinkedIn Profile a refresh. I’ve been pretty intentional with my LinkedIn network thus far, only connecting with and accepting connection requests of people I know, but it’s time to branch out. Through similar outreach processes we have in place for our clients, I plan to connect with people who have strong networks, in a variety of industries who will not only strengthen my network but in the future could be a Center of Influence, a good contact to have when looking for a job, or a good prospect for a business opportunity. As we are focused on developing LinkedIn profiles daily for many clients, it’s a good reminder to keep our own profiles current and to switch things up every once in a while. I’m going to change my background photo, add the blog posts that I’ve written for Intero to my profile, update + add to my groups and interests, and ask for a few recommendations. Charlotte: This spring I’m going to be focusing on not only cleaning but also organizing and improving my LinkedIn profile, network, and activity. We’re constantly providing support for our clients when it comes to updating profiles, nurturing networks and making connections, and can fall short when it comes to our own profiles. First, I’m going to focus on keeping my profile up to date. This means with my profile picture, summary, and headline. It’s always important to update your profile photo every year or 2, or even if you get a new haircut or change up your look. Don’t forget about background photos. I find this area fun because it’s where you can express yourself outside of your summary. I also want to focus on growing my network. It’s important to connect with people who I know personally, or who I share mutual connections with who would improve my network. I can speak for myself when I say it’s time to practice what I preach. Connecting with clients, people at networking events and anyone who I meet out and about who I could potentially work with or support in the coming years is what I plan on working on this spring and carry through the year. Liza: Last year in the midst of my first ‘real’ job post-college I was sending out and accepting connection request like it was my job- to hiring managers, HR directors, recruiters, etc. This spring, I am going to go through and remove some connections that no longer serve a purpose or who I would most likely never reach out to again. I am going to reconnect with some alumni, make sure that I am connected to everyone I should be, and begin posting more. I want to build a solid network and provide that network with useful information, entertaining articles, anything else business related that I see fit, and remain present as a LinkedIn Coach to any of my connections who may need help. Sarah: This spring, I am dedicated to cleaning out my LinkedIn connections and will strive to make more useful ones to take their place. I have a lot of people that I connected with who were connecting to me with no intention, other than to have a large network. I accepted them before I was familiar with LinkedIn and different strategies of connecting. Now, I am going to download all of my 1st-level connections and go through which ones I really know and can benefit from having in my network, whether it is today or 10 years down the road. 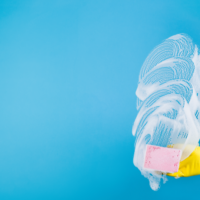 What’s going to be your spring cleaning commitment on LinkedIn? If you aren’t sure of a great place to start, you can always reach out to us. Everyone has some cleaning they can do, whether it be in your network, or on your profile.